Falakata, February 4: Taking cognizance of the situation and in an attempt to stop illegal migration, the central government has taken several steps. From strengthening the armed forces to documentation, the government has not left any stone unturned to stop these illegal acts. Addressing a strong protest against illegal migration, Union Home Minister Rajnath Singh said the Centre will use technology to seal the international borders of both West Bengal and Assam with Bangladesh, through an integrated border management system. Speaking at a rally in Falakata in Alipurduar district, Rajnath Singh alleged that Bangladeshis are illegally entering West Bengal. He added that the Centre had sought land from the West Bengal government to erect fencing to seal the border with Bangladesh, but is yet to receive it. 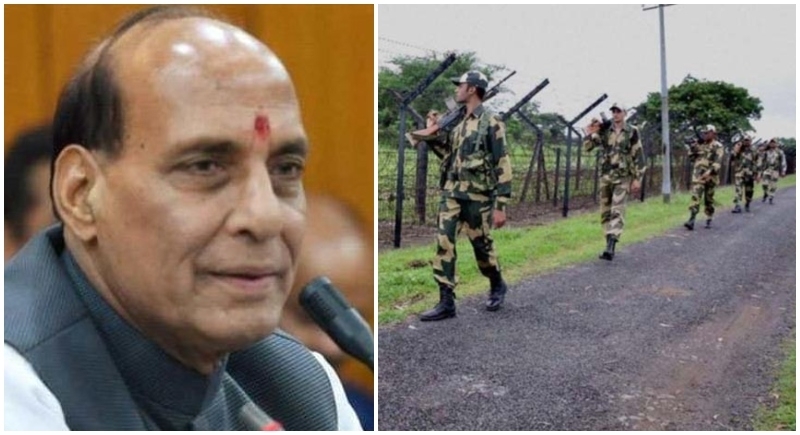 Rajnath Singh said that the government has decided to use technology to seal both international borders with Bangladesh using a comprehensive integrated border management system. The move will help prevent infiltration as well as smuggling, and ensure safety and security of the nation amid a changing demographic profile of West Bengal. Coming down heavily on the ruling TMC, he said, "Maximum violence takes place in West Bengal as per records. None of the 'Ma, Mati and Manus' (mother, land and people) are safe under their rule." Nearly 100 BJP workers have been killed in the state and none of those involved will be spared, Singh asserted. "Political violence should end in West Bengal. And for that to happen, Bengal will have a BJP CM in 2021," he said. Currently the state of Bengal has been under vigilance over the CBI raid in the chit fund scam and there has been a major showdown between the CBI and the Kolkata police. WB CM Mamata Banerjee covering up and saving herself from the clutches of scams is trying hard to divert the attention by sitting on dharna and playing politics to slyly rescue herself. Meanwhile, Union Minister Rajnath Singh has called up on West Bengal Governor to apprise him with the facts of CBI action on Kolkata Police Commissioner Rajeev Kumar.